The Irish flag consist of 3 vertical stripes: green, white and orange. The green stripe on the left symbolises the Emerald Isle and the Catholic majority of the population. The white stripe in the centre expresses the need for peace between Catholics and Protestants. The orange one represents the Protestant majority. Orange was the colour of William III of the Protestant House of Orange. There is a harp on the creast symbolising a strong musical tradition which goes back to the ancient Celtic folk music tunes, many of which are still alive today in traditional Irish tunes. 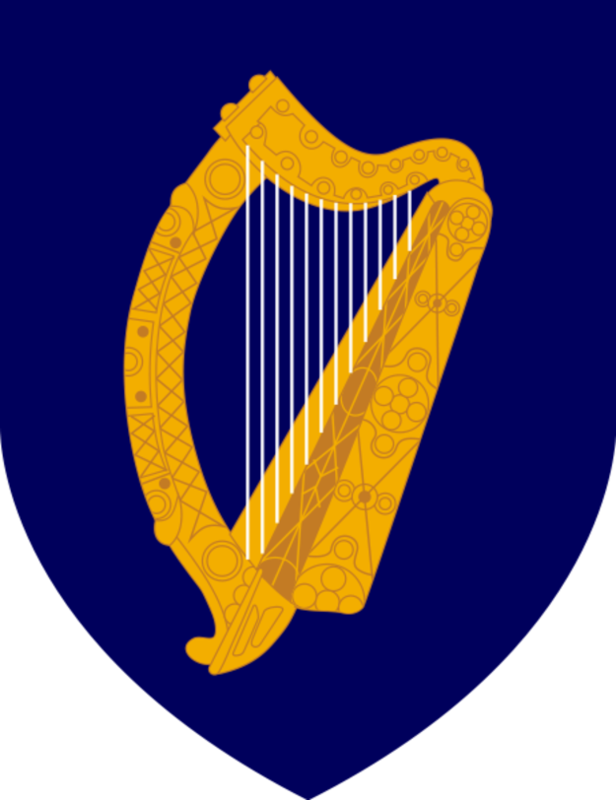 The Irish national anthem is called " The Soldier's song". It is sung both in Irish Gaelic and english languages. The Irish Republic covers 70,282 sq.km., which is about 80 pre cent of the Emerald Isle. The rest is occupied by Northern Ireland, which consists of 4 provinces: Ulster, Munster, Lenster and Connaught. The island is devided from Great Britain by the 20-kilometre- wide North Channel. The sea coast is wiold, rocky and beautiful. Most of the island is flat. A central plain is ringed by the low mountains in the South and West and by lowlands in the East. The highest mountain is 1,041 m high Carrauntoohill in the South. The Shannon River goes through one-fifth of the country and forms many wonderfull lakes which are called "Loughs" in Irish Gaelic. The Shannon is the longest river in the British Isles. The climate is temperate, with mild winters and cool summers. There is a lot of rains no matter which season which is good for vegetation but not so good for the people. Even in summer it is necessary to wear a thick wind-and-waterproof jacket as the weather can change several times in a single day. No wonder, that weather is a frequent subject of conversation everywhere. A common comments is "the rain this summer is the worst yet" or "it is never been as bad as this year'. The Irish Republic has 3.5 million inhabitants. The population is very young; about half of Ireland's people are under 25. Ireland is a Catholic country. More than 90 per cent of Irish are Catholic. Statues of the Virgin are everywhere, the churches are crowded and there are pictures of saints in every living room. Also there is hardly an Irish family that does not have at least one member who is a priest or nun of the Catholic Church. The Irish originally spoke an Irish Gaelic, a Celtic language, which is a rich, graphic language. The English tried hard to eradicate the Irish language by various means. In 1831 they outlawed Gaelic education and made English the only language of education. They even changed the original Gaelic place-names all over the country to English ones. Despite their efforts, in the second half of the 19th century half of the population of Ireland still spoke Irish as their native tongue. With independence in 1921, Irish became the official language. But by that time only 20 per cent og the people spoke it as Irish had become a language of the poor. In the meantime, most of the people had either died during the great famines or emigrated, with the majority going to the USA. Nowadays the Gaelic language is getting more and more popular, so that in some Irish regions English is not even spoken.